Condor makes backpacks like no other manufacturer, so it made sense to start here with our quest for the perfect backpack for camping, walking and general outdoors or off grid activities. Initially a camping goods producer, the company now plow most of their resources into their trusted rucksacks, helping everyone from hunters, law enforcement and the armed forces get on with their day job. But when the day job is done, you may also want to use your Condor backpack for recreation and travel. As we shall see, some of these will comfortably transport your laptop and other gadgets, that you may well use at work as well as at play. Whoever you are and whatever it is you want to do, there should be a Condor backpack that can pick up the slack and then transport it ably on your shoulders without it ever becoming a burden. Because Condor backpacks are so versatile and come in so many sizes, they may be used by anyone and everyone, literally, from army personnel to boy scouts or busy moms wanting a buggy bag for diapers. With these you should never have to unpack the whole thing, just to take one piece out. They have multiple side pockets, mesh pockets and easy access zippers that there is a place for everything and everything in its place, literally. No matter how much kit you’re carrying, there’s a size to meet your needs, whatever that may be. More stuff that you will want to know. Need to keep up to date at work whilst on the hop? Not a problem with the Condor Venture. With a compartment designated for a laptop, this would be our pick of the technology transporters. But this is far from all, there are mesh pockets that can be filled with things that might leak, without it causing a damper on things. Also there’s plenty of space for all your pens and pencils and other bits and bobs. Because this makes it so easy to carry your work and all the tools needed to do it, we can see this one appealing to students and professionals alike. So whether it’s the daily nine to five or something a bit more adventurous you are planning on, this backpack ticks all boxes for performance, practicality and comfort. 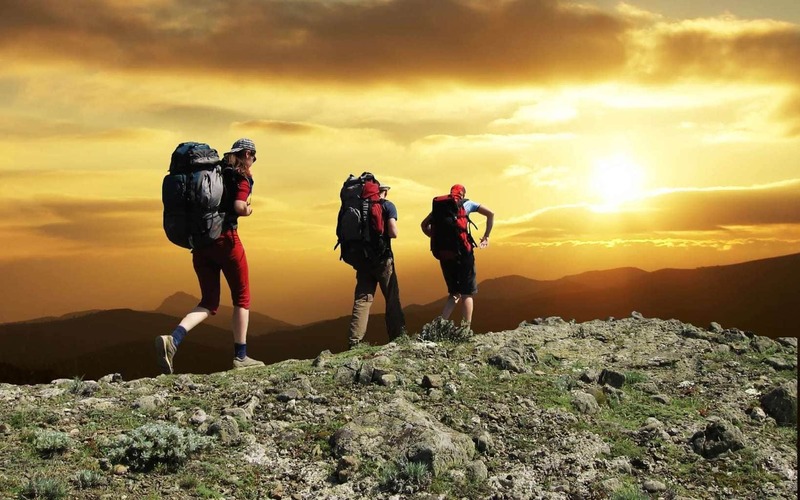 Don’t be put off by the fact it’s not quite as enormous as big bro the Three Day Assault Pack – this is more than ample for most people’s needs and can accommodate a hydration pack for the more extreme usage situations. Everyone who owns these seems to think they fit pretty neatly with belts and straps to make it stay on nice and cozily. Load bearing shouldn’t be a problem because of the padded pack panels to provide comfort and some airflow. Well-made and durable, these come with a high approval ratings from various owners. The absolute basics that you should know about this product. More stuff you should know about this backpack. Two Large Pockets: 5” x 6” x 3” Located on rear, 3 elastic mash pockets and zipper mesh pockets. Built for some severe heavy duty usage, the Three Day Assault Pack is so called because it is capable of carrying everything you need – food and water –for three whole days. 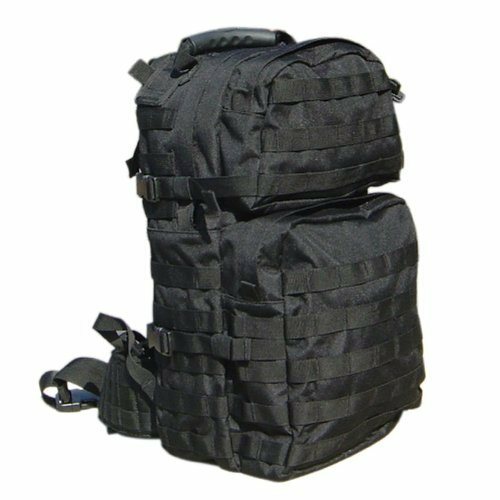 Utilized by troops and the armed services, this can fit in a hydration bladder into a specially designated area and still have more than enough space for the rest of it. It should easily fit a laptop and other devices and has in total seven compartments. With more mesh compartments than you can shake a stick at and plenty of space for radios, knives and other kit, this will serve you equally well on a military operation or simply for a weekend’s fishing trip. Whether you want to carry this on your back or need to drag it along, the handles are more than up to the job and there are D rings for attaching more things onto it. But is it comfortable? After all, you could be wearing this for three long days? Well, the straps are not only incredibly strong but also well-padded and sufficiently wide enough to ensure they won’t cut into you. All in all the 3 Day Assault pack is something you need if you like your weekends off the grid and a must for logistical operations. Bare bones of the Compact Assault Pack. Take a closer look at the specs. Front Top Compartment: 4″ x 7″ x 2.5″. Similar to the Three Day Assault Pack, but obviously, smaller, this is the most compact of the four selected backpacks. Its overall capacity is 1362 cubic inches, so it is not going to pack as much as the other bags do, but as long as you realize this, you should be fine. Advertised as being best for a ‘day pack’ this should provide some clues as to what its intended usage is. Of course, you can use it as an overnight bag – a lot here depends on whether you’re the type to travel light or not. However, we would warn against temptation to pack this too tight, as this could result in breakage. Just treat it with respect and it should be just fine for daily use – whatever you decide to use it for. Hydration pack compatible and with four major compartments, this should fit a smaller laptop, even if it’s not especially designed for it. Like the others, there’s enough zipper compartments to keep even the fussiest packer happy and it’s comfortable enough to have on for a couple of hours at a time, definitely. But we don’t necessarily recommend stuffing it to the gills and then going on a three day assault style mission – this little backpack is not the same as its bigger brother the Three Day Assault Pack – this one is really meant for lighter use. On the other hand, for smaller, lighter individuals (petite women especially) this could be absolutely perfect. First facts about this backpack. Laying neatly in between the Three Day Assault Pack and the baby of the piece, the Compact Assault Pack is the Medium Assault Pack. Roughly comparable to the Venture Pack, this is in the same kind of ballpark to it size wise and capacity wise (you can actually fit a bit more into this one, but it is also a little cheaper). Yes, it’s designed to take or at least will fit a hydration pack and like the others, the handles are built to last, whether you are carrying this on your shoulders or want to drag it along. With a molded back panel, this should make light of your burden, literally. 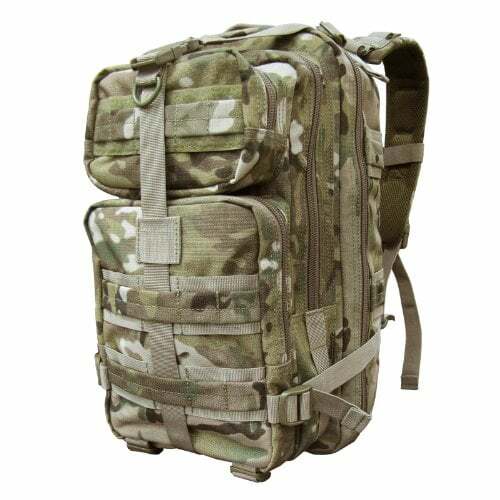 We think this is the ideal pick if you want to carry a bit more than just enough for one day or night, but don’t need to run to the lengths of the Three Day Assault Pack. In other words, this option should suit most people the best for general usage. Be it camping or even just the day to day grind of the commute to work. Whether your jungle is the urban one or the actual one, it should see you right in a variety of situations. Maybe just something that you’d keep in the car boot for emergencies, this is one versatile backpack that, if not over stuffed, should keep going for many moons. No matter who you are, there is a Condor backpack out there for you. But the one you pick is an entirely personal choice depending on who you are and what you want to do with it. If you’re a petite female, then you probably want to steer away from the Three Day Assault pack as it might overpower you. The Compact Assault pack might be better for lighter use. 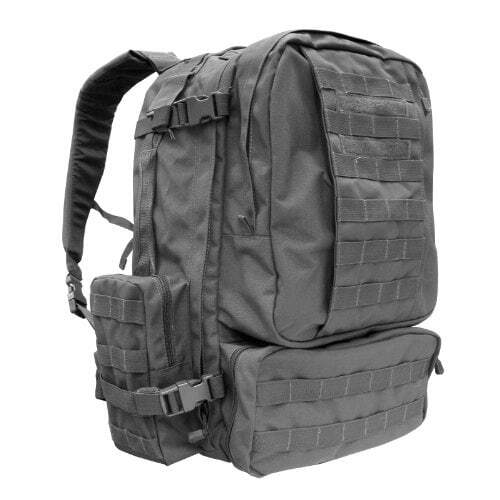 But equally, either the Venture Pack or the Assault Pack Medium might do the trick, should you need to haul around a bit more than just day kit. However, anyone hell bent on serious camping, fishing or even military style use needs the Three Day Assault Pack in their life. Because it is the toughest, most reliable and portable out of all four in our line-up. Additionally, this is the only one that has a whopping 3000+ cubic inches capacity and can carry so much in relative comfort. So the Three Day Assault is our ultimate pick of the packs. ….But it is up to you to pick your battles wisely with it! Browse our other backpacks reviews. Looking For The Best Axes For Sale?